PRETTY IN PINK California grows most of the country's pomegranates. California's pomegranate harvest is in full swing. About 95 percent of the crop is the large, dark variety called Wonderful. The 2017 crop is expected to be a bit light, as trees recover from years of drought. But while yields will be down, the quality of the fruit is expected to be high, as sometimes happens with fruit trees. Expect California pomegranates to be larger, juicier and sweeter. Worldwide, pomegranate consumption is on the rise for culinary and health reasons, and there is also demand from cosmetic and pharmaceutical industries. 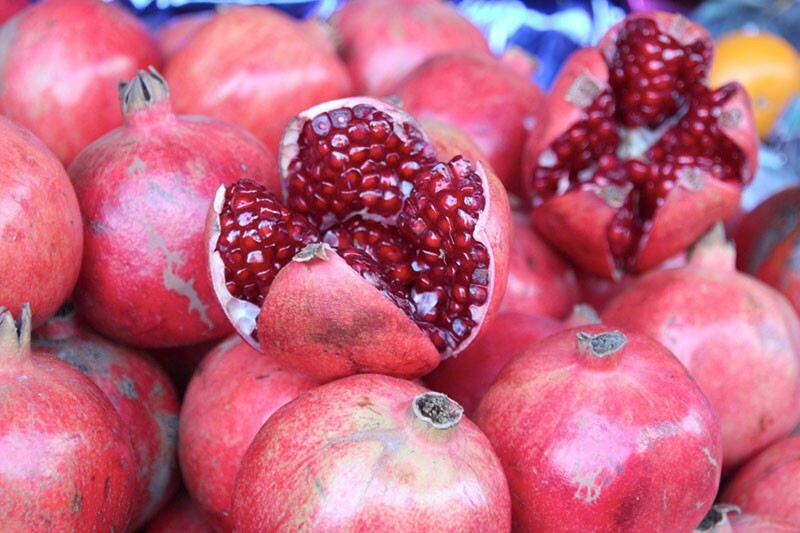 A peeled pomegranate looks like the world's biggest and most delicious freshly cut jewel. The ruby-like seeds are called "arils." There are many ways to get them out. Azcookbook.com has a video that demonstrates how to quickly remove the arils by cutting along the membranes that run between them and then swatting the arils from their clingy membranes with a wooden spoon. Alas, I usually end up clawing it apart with my fingers and dumping the arils in a bowl of water so the membranes float out. But I don't try to remove every last shred, as the membranes are where a many of the fruit's potentially medicinal compounds reside. Pomegranates & Saffron: A Culinary Journey to Azerbaijan for a dish called "narnumru"—basically fried eggs atop fried pomegranate arils, which burst open in the pan's heat and steam the eggs sunny side up. It's a visually shocking dish, but in your mouth, it all makes perfect sense. Buyuran starts with a half-cup of chopped onion in a pan with butter and a little olive oil. When the onions turn translucent, she adds two cups of arils (for two eggs) and fries them for a few minutes, before cracking the eggs on top and covering briefly. If you have a glass lid, you can watch the eggs turn white before your eyes in the pomegranate steam. Everyone in my house thought the idea of frying eggs on pomegranate arils was awful, even those who professed to love both pomegranates and eggs. I made a batch, personalized with bacon and browned bits of deer meat, prior to the addition of onions. The haters were all wrong, of course. And they never got to find out how wrong they were, because I ate it all. Then I began stir-frying meat with pomegranate seeds, onions and garlic, while playing around with various spice mixtures from pomegranate country. Egyptian dukkah was a standout. Soon enough, I was marinating meat in pomegranate juice, as Buyuran says she does with kebabs. Strong-flavored meat like lamb or goat is wonderful in a pomegranate-juice marinade. By far the simplest way to cook with pomegranate is to make what you are going to make, and then sprinkle fresh pomegranate seeds on it. Sprinkle them on salad, soup, meat and rice. There is no end to the ways we can use that bright juicy tang, balancing the fat in food with a burst of acid. A handful belongs atop a bowl of linguini with creamy mushroom sauce, and on your morning Cheerios.